Selling your house is like parting with an old friend. It’s where you’ve shared love, life and laughter. It’s been your refuge from daily life, where you’ve watched kids and the garden grow...where people you love have shared your good times, your trials, your successes, your tribulations and your triumphs. Where, when you close your eyes, you remember the laughter....the good times. Now the cycle turns. Like many friendships, it’s time to say goodbye, to move on to new adventures, to get to know a new friend, to explore reinvigorated living in an exciting new place. Larger perhaps to suit your growing family or lifestyle - or smaller, where those large rooms, now empty, can reverberate with growing families once again. Your old friend offers you one last service by providing you with the financial resources and the wherewithal you need to move on. A parting financial handshake, celebrating the years you’ve had together. But today, housing is too often treated as a mere commodity. Something secondhand to be bought or sold by fast players, where you and your house are just numbers on a corporate balance sheet. Where your feelings and wishes are brushed over on the way to an often far-too-hasty sale. Parting with your ‘friend’ requires the sensitivity and understanding of someone who can see the true value of where you’ve lived, who understands your emotions. Someone who also understands how to sensitively maximise the value of your investment. 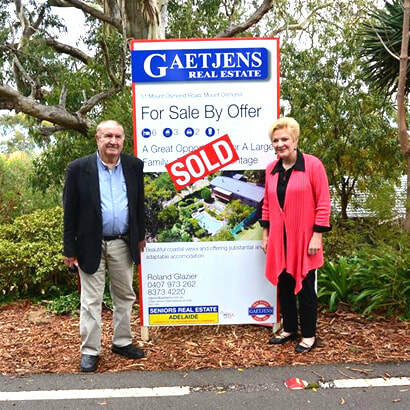 Gaetjens people know what you’re going through and can see the value of your home through your eyes - and the eyes of potential purchasers. Simply, your need a new friend to help you part with your old friend. Backed by knowledge and understanding built up over decades as Adelaide’s oldest real estate company, Gaetjens knows how to maximise your investment to ensure you get the best possible return in today’s real estate marketplace, while guiding you through the emotions the sale of a big part of your life can bring. Discover the difference of doing business with Gaetjens – ‘Property done Properly’.